When Paul Dini and Bruce Timm premiered their hip, stylish take on Gotham City's Dark Knight in "Batman: The Animated Series" in September of 1992, they redefined Batman for a new generation and revamped the look of cartoons for years to come. 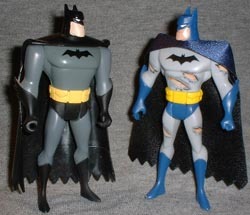 Kenner was the first to bring us BtAS figures, based on the original cartoon designs. By the time the character designs changed, Hasbro owned Kenner, so they brought us the next series. Now DC Comics' master license has passed to Mattel, and they're picking up right where the others left off. Though more realistic offerings are due soon, Mattel started their DC line with animated-style figures. In addition to Justice League toys, tying in with the Cartoon Network show, they're also releasing two-packs of the Batman family. In typical Mattel fashion, every two-pack has some variation of Batman; all the same figure, just with different paints. It looks like customizers will again have a plethora of excess Batman bodies to draw from. This set, Battle Scars Batman vs. Catwoman, is proving very popular with collectors - not only is this the first time we've gotten a new-style animated Catwoman, but the relationship between Batman and Catwoman in the comics has just taken a long-awaited turn. As a boy, Bruce Wayne witnessed his parents' murder and vowed revenge against all who broke the law. Relying on his physical prowess and mental superiority to bring his enemies to justice, he is vengeance... he is the night... he is Batman! 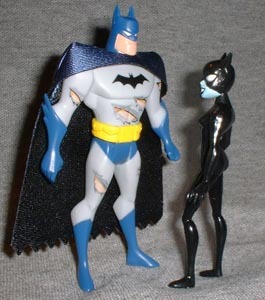 Batman, seen here in his classic blue and gray costume, stands 5" tall. The sculpt is a bit bulkier and more angular than the previous animated figures, and moves at the Big Five. He's wearing the big pockety utility belt that is always much cooler than those ridiculous capsules. Batman's cape is real cloth, stitched to shape and attached beneath his head, though I don't know why it's a different color than the figure's painted blues. 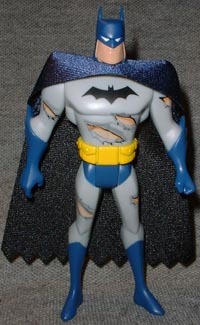 His body has been screen printed with several rips and tears to his costume - evidence of his tussle with Catwoman - that are all nicely designed, but still disappointing: molded bits would have shown more care, though they would have required Mattel to not just reuse molds. Rich, glamorous and stunningly beautiful is how the world of Gotham high society sees Selina Kyle. A darling of the jet set, Selina is apparently independently wealthy, and is noted for giving large donations to animal protection organizations. What no one knows is that Selina Kyle leads a double life as the mysterious Catwoman, a shadowy figure that preys on the fortunes of Gotham's idle and corrupt rich. The same socialites Selina shares a glass of champagne with one night might find their private safe ransacked by Catwoman the next. Sleeker and more stylized than any Catwoman before her, this kitty is 4 1/4" tall, putting her just on level with Bats' chest. Her body is painted gloss black to represent her black leather catsuit, and she's got a wicked grin on her face. She moves at the Big Five, though her hips allow her legs to spin horizontally instead of moving forward and back. Catwoman's left hand is open and her claws are flared, while her right hand is molded to hold her whip. Actually, that hand displays one of this set's major problems: no accessories. The only things included with this set are the two figures, which seems to be normal for Mattel so far; neither the Batman Animated figures nor the first series of the Justice League come with anything other than the toy itself, and that's quite a disappointment. Were these rushed through production before gear could be designed? Whatever the excuse, it's pretty lame. Much as I'm glad to be getting brand new versions of Batman and his supporting cast, I wish Mattel were being smarter about this. Enough two-packs, already; stop relying on idiotic variants and give us good toys. Will Mattel ever wise up? Tell us on our message board, The Loafing Lounge.